Allright... A nice way to celebrate the 200th POST ! Gimme all that but gimme one of the most talented french soundtrack composer ever. THEN, the pièce de résistance. The (most) complete stuff, the (mostly) complete soundtracks. And then, unfortunately, he died. As you can imagine, it took me a few hours to process all those so I really hope you'll all enjoy ! ! WOW!!! voila ce que j'apelle un bienfaiteur, merci beaucoup. I have been slowly collecting anything I can get my hands on by Francois. I have searched high and low, got a few but nothing like your collection. Thank you soooo much, this guy is by far one of the best producers of all time. This is sooo kind of you, thank you so much, Paul! DAMN! Great many thanks for this post, Francois is a tru master of the art! Great thanks again! Merci Paul pour cette anthologie. Je fait pâle figure avec mon petit post du jour. Thanks very much, and congratulations on your 200th. Brilliant! a great respect my friend!!! I knew this one was an instant winner! Cheers, enjoy all ! truly an amazing composer, quite possibly one of the most talented of all time, imho...thank you paul. My opion Francois de Roubaix was a biggest french composer! 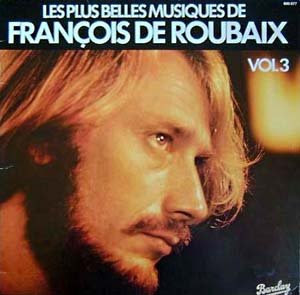 François De Roubaix is amazing. Thanks for posting it up. Wonderful post of one the most gifted film composers ever! I could not think of a worthier anniversary post. Great, great stuff from one of my favorite blogs. @ FranKut : many thanks - indeed high res scans!! great to have those. @ kustonbeater : yep Michel Magne and Alain Goraguer should 'be processed' by same way.. I'll start gather the goodies..
this post intented to promote rare stuff in the first place.. that's why i didn't post it.. as a matter of fact, i really don't know why i posted 'Le Vieux Fusil'..
Incroyable ! Ça c'est une somme impressionnante ! Merci beaucoup. Merci, monsieur. C'est tres bon ! merci beaucoup! j'ai fait des découvertes, et toutes ces maquettes, quel plaisir ! thank you for these excellent posts. et la cerise sur le gatal ?!? ...n'ooblions pas les levres rouge quand meme !et les dunes d'ostande ! Possibly the best ever blog post in history. A remarkable achievement, to present such an archive of fabulous music. Thanks, Paul! Mil gracias por este y tantos otros posts.Saludos. super boulot, merci bcp !!! This is incredible! Thank you so much! Merci!!!! ouahh!!!!!! Bravo you're really a Don!! Many, many THANKS, ¡ BRILLIANT !. Thank you so much for a wonderful cultural education!!!! -I can't even articulate how much I've been enjoying listening too and learning about François De Roubaix. Much love to you from Vancouver!!! F@#$ing great! Thanks so much! "la guerre d'algérie"...l'aurais tu par hasard??? MERCI BEAUCOUP. I CANT TELL HOW MUCH I APPRECIATE THIS. I really can't thank you enough. This is just fantastic. This is truly amazing. Thank you VERY much. MERCI, j'avais les trois LP, c'était un génial musicien avec des idées folles, comme le steinway enregistré à l'octave et reproduit à mis vitesse dans le vieux fusil. Merci aussi pour le french rock des seventies. Your Pleasure : My Pleasure. I hope I am not taking too much of your bandwidth downloading these amazing albums. I hadn't heard of de Roubaix until yesterday and I wonder how it was possible -- he's incredible. Thanks so much for posting these hard-to-find albums. Much appreciation! J'ai découvert le nom de François de Roubaix dans la bio de Jean-Loup Dierstein. Ce nom sonnait familier à mes oreilles. Je l'avais déja lu, mais où ? Je google "F. de Roubaix" et j'arrive sur votre blog. Et tout de suite, le son familier des B.O. comme la Scoumoune m'a rattrapé. 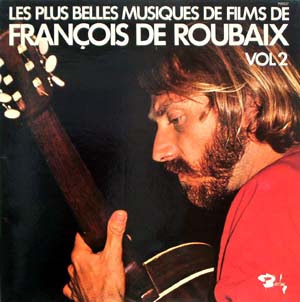 Des bandes son inoubliables, auxquelles je n'associais pas encore le nom de de Roubaix. J'adore. Je me suis souvenu avoir lu le nom de François de Roubaix pour la première fois au générique de Chapi Chapo dont j'adore la musique. Thanks for this titanic works of compilation. Ho, merci merci merci ! Thank you for posting these rare LP's Mr. Durango. OUT of control. bow to his majesty ;) tremendous! Just found these Francois de Roubaix insane collection of yours..
terrific post. THANKS A LOT! C'est bien sympa tout ça.En tant que fan de Lino Ventura je suis comblé.Par contre je cherche l'intégrale des Garndes Gueules. I just stumbled on this through a visit to your Teddy Lasry "Racing" post. Almost everything Roubaix that I have came from the Montreal library (a NON-VIRTUAL space), but this a goldmine! Thank you! Votre blog sob Franções de Roubaix c'est magnifique, unique. Un seul mot : MERCI en grand! C'est énorme!!! wow incredible...!! nice to see this post. my god. like a lot of people, i've been trying to get my hands on this stuff with little success. I am making my way thru Les Aventuriers; it is a pure and utter delight. 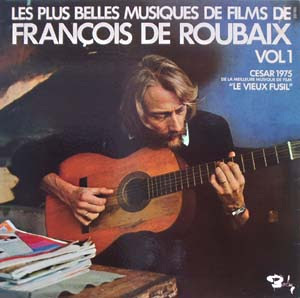 I discovered your collection after I read that de Roubaix was "a kind of a French Morricone of the 60s who scored most gallic noir movies of his time" and decided that I needed to hear his work. I cannot begin to tell you how grateful I am for this posting. 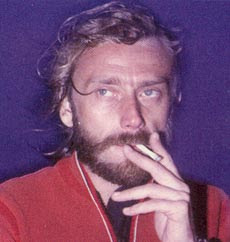 F-A-N-T-A-S-T-I-C.
je cherche désesprément le documentaire fait sur lui : François de Roubaix, l'aventurier. Si quelqu'un peut le faire partager, ce serait Noel. Thanks a lot work this wonderful music. I never heart of Roubaix before I read your blog. Now I'm addicted and have to have him on a daily basis. Inouï ! Un travail considérable. Des heures passées pour faire partager un merveilleux compositeurs dont chaque musique n'évoque pas seulement le film à laquelle elle est attachée, mais dont le son renvoie (pour ceux de ma génération) à une période tellement moins difficile. Ce sont des bouffées de souvenirs d'enfance et d'adolescence qui affluent et me submergent. This may be the single greatest blogpost I have ever had the pleasure of finding. I have just discovered this wonderful blog but I can't seem to access any of the links. Can anyone help me please? Sorry I figured it out. Thank you Paul! Absolutely fantastic post. thank you very much. wow this looked great, cant find it anywhere else... however the links arent working anymore... any chance of this getting fixed? I've been going rounds on the net to find it anywhere els, but unfortunatly only scraps of this tresure I can find. Pritty please with sugar ion top, could you make the links work again somehow? les liens pour telecharger les albums sont ils encore disponible ? Merci pour ce site plein de découvertes inoubliable. Un géant de la composition musicale ! Bonjour, est-il possible à qq1 de m'envoyer des liens ? Do you know this song ?